Insalata Caprese, a combination of fresh buffalo mozzarella, ripe tomatoes, and fresh basil is an Italian classic, particularly during the warmer summer months. These skewers are a variation of that that can be served as finger food, are quick and easy to assemble, and are great for outdoor entertaining. I’ve made these tidbits many times but never thought to post them as a recipe because they are so simple to prepare. So many folks I served them to however were surprised by the idea and seemed to thoroughly enjoy them, so I decided to post the recipe (or non-recipe) anyway. Basically you take small skewers, mine are little bamboo ones, and you alternate bocconcini, (small mozzarella balls), cherry tomatoes, and fresh basil leaves. 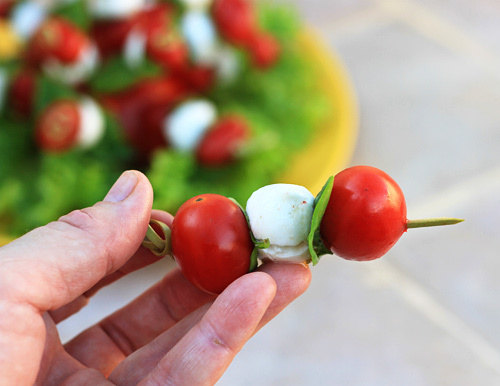 If you cannot find the tiny mozzarella balls, you can simply cut a piece of fresh mozzarella into equal size squares to fit the tomatoes and use those instead. I find if my mozzarella is of good quality, and my tomatoes are ripe and sweet, then all I need to do to bring out the flavor is to roll both in a good quality seasoned extra olive oil first before I assemble them onto the skewers. I do know some folks who create a balsamic dipping sauce for the skewers, or who dip the mozzarella and tomatoes in a mixture of balsamic vinegar and olive oil before they serve them, but that can get messy unless guests have small plates to hold their skewers. I won’t list exact ingredients as it will depend on how many you wish to serve, but use the best ingredients you can find, and this simple appetizer will be enjoyed by all. To serve mine, I take a large tomato and cut a slice off the stem end so it will sit flat, and then stick the skewers into that to serve. 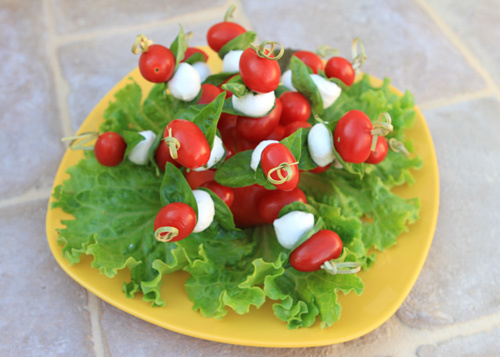 If making a large quantity, simply arrange a few of these tomatoes on a large platter covered in lettuce leaves. Mozzarella is a good source of dietary calcium as well as protein. A light summer option for lunch or dinner. Place olive oil in a bowl and season with salt and pepper. 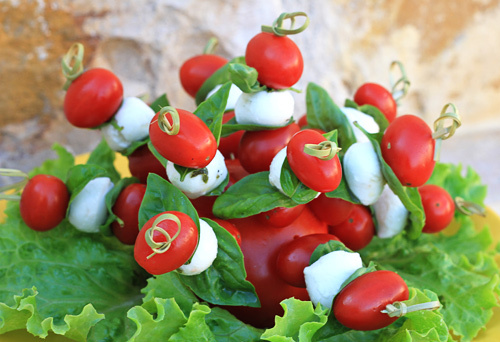 Toss the mozzarella balls and tomatoes in the seasoned oil and then thread onto small skewers as shown with fresh basil leaves placed between.